Carl J. Hinshaw3,4,5,6,7,8 [James Carl Hinshaw9,10]. 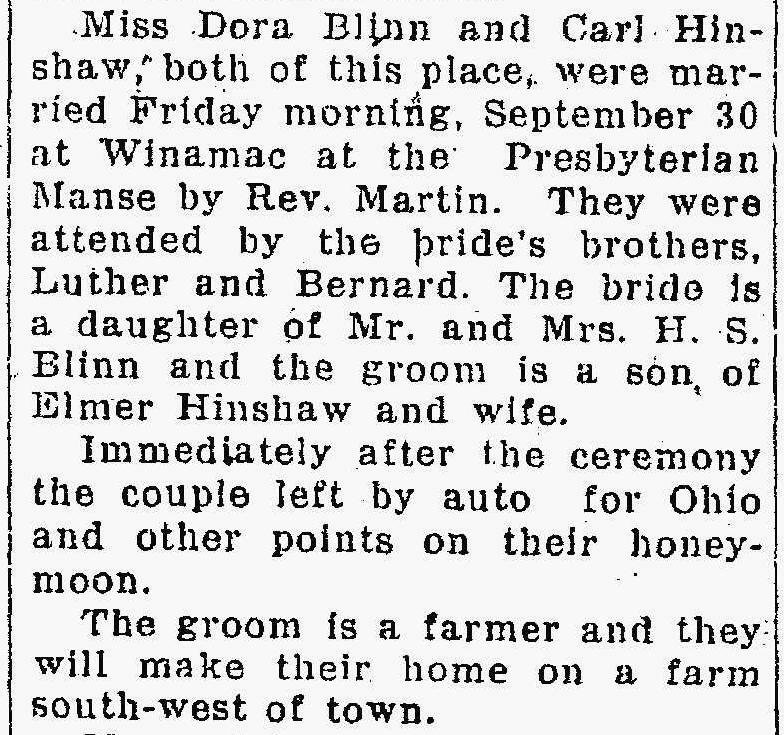 Carl and Dora's marriage license was reported in the "Logansport Morning Press" (Logansport, Indiana) on Saturday, Oct 1 1921;10 their marriage was reported in the "Logansport Morning Press" (Logansport, Indiana) on Sunday, Oct 2 192111 (see scans below). Hinshaw, Carl, head-of-household, age 31, born in Indiana; parents born in Indiana; first married at age 25; rented home; radio in home; occupation: farmer, farm; not a war veteran. 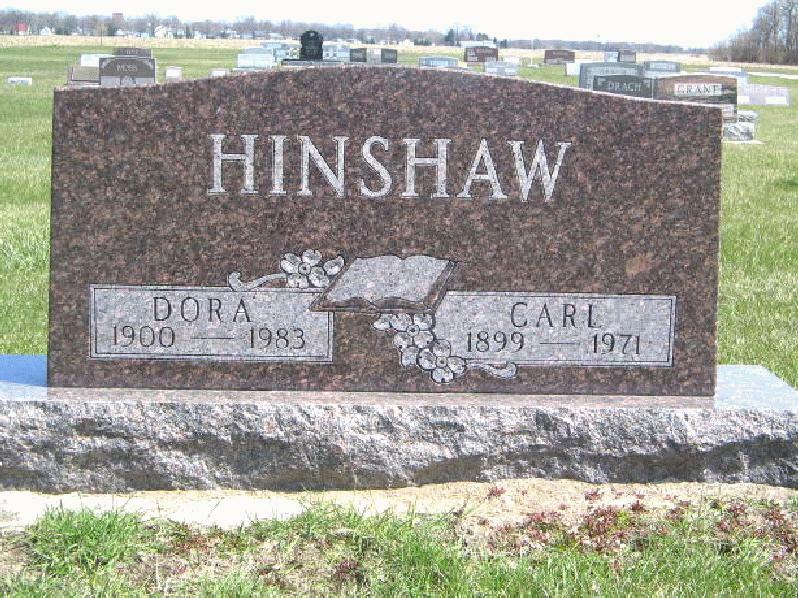 Hinshaw, Dora, wife, age 29, born in Indiana; parents born in Indiana; first married at age 23. RootsWeb WorldConnect data by Leroy Hatfield (). 1900 census, Van Buren Township, Pulaski County, Indiana; roll T623-399, ED 98, page 10A, line #25, dwelling #191, family #193. 1910 census, Van Buren Township, Pulaski County, Indiana; roll T624-375, ED 130, page 128A, line #27, dwelling #166, family #169. 1920 census, Van Buren Township, Pulaski County, Indiana; roll T625-461, ED 177, page 3A, line #1, dwelling #47, family #47. 1930 census, Van Buren Township, Pulaski County, Indiana; roll T626-623, ED 14, page 6B, line #56, dwelling #128, family #129. "Logansport Morning Press", Oct 1 1921; http://www.ancestry.com. "Logansport Morning Press", Oct 2 1921; http://www.ancestry.com.